Karst Worlds: The 8.2 ka event: is it registered in Belgian speleothems? The 8.2 ka event: is it registered in Belgian speleothems? A new paper by S. Verheyden, , E. Keppens, M. Van Strydonck and Y. Quinif titled "The 8.2 ka event: is it registered in Belgian speleothems?" is published in the latest issue of the Speleogenesis Journal. 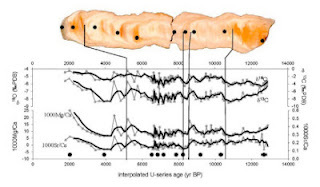 The petrographic, isotopic and chemical changes occurring around 8.2 ka in two stalagmites, one from the Père Noël cave (Han-sur-lesse, Belgium) and one from the Hotton cave (nearby Marche-en-Famenne, Belgium) are presented. The Père Noël stalagmite presents a particularly dense grey compact calcite around 8.2 ka, while the Hotton stalagmite presents a deposition hiatus of ca 1100 years. Besides the macroscopic aspect of the stalagmites, changes in their isotopic (δ18O and δ13С) composition and in their chemical (Sr/Ca, Mg/Ca) composition are observed. Regarding the early start and the duration of the climate deterioration, it is impossible to link the onset of the observed wet phase in the studied speleothems as directly related to the so-called 8.2 ka event. 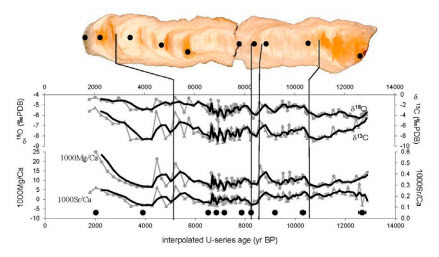 The question arises if the climate deterioration around 8.2 ka observed in both stalagmites is one among other deteriorations occurring during the early Holocene.